Don’t worry about me! Just because you might not hear from me everyday does not mean that I have fallen off the exercise train! I have been very good about getting to CXWORX/BodyPump classes on a regular basis at the gym. I haven’t been running a lot lately because of those itchy legs and rashes I was getting from running outside. I have been going for walks a lot and using the elliptical at the gym for a nice change. As soon as the fall weather comes, I know I will really want to run outside. I’ve also been eating very healthy meals and I try to change up my breakfast each morning. I usually rotate between smoothies, eggs and cereal. Smoothies have by far been my favorite this summer and I don’t even have a good blender! Even though I dream of the Vitamix, I use this VERY old and crappy blender for my smoothies and it might take a little longer, but it works. 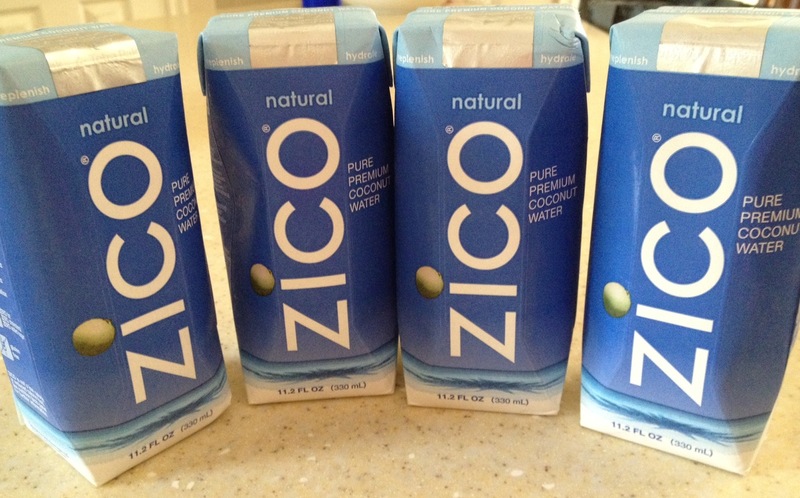 A few weeks ago, the nice people at Zico sent me a bunch of their coconut water to try out. I’ll be honest, for some reason I have been scared to try it! I don’t know why!! I like coconut stuff, but for some reason I didn’t think I would like it… but I do! I’ve been putting it in my tropical smoothies and it is great! I’ve been using the My Fitness Pal iPhone app ever since I finished my spring marathon to get my eating back in shape, since I wasn’t going to be running 30-40 miles a week over the summer and didn’t need to eat a box of pasta everyday! I’m always low on potassium when I log my food, so coconut water is great to get extra in for the day. Here were my supplies for my tropical smoothie this morning. 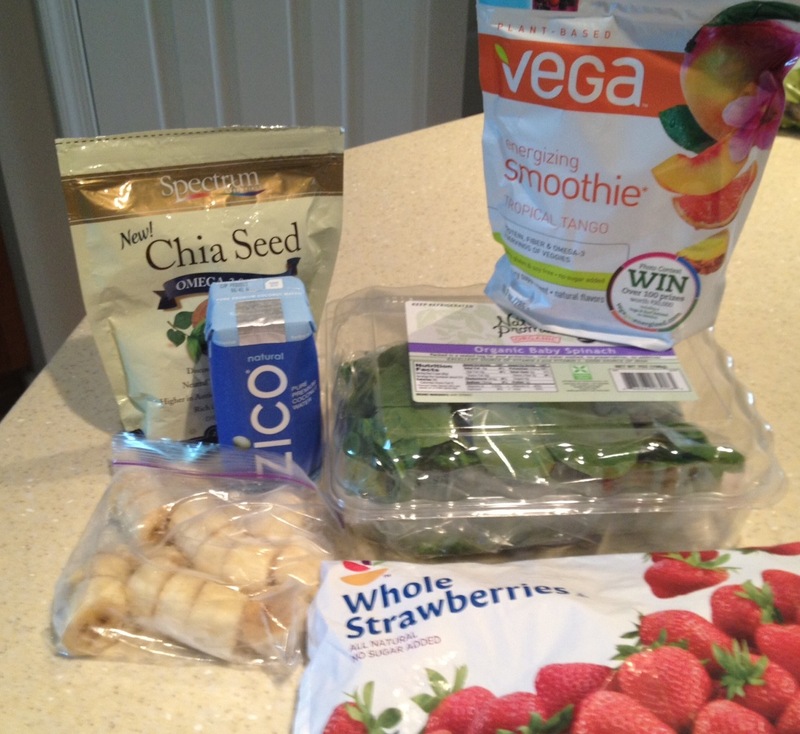 An 11.2 oz box of Zico coconut water, my awesome Vega tropical tango smoothie protein mix, chia seeds, 1/2 a banana (that bag has 2 in it… I like to freeze a bunch of them at a time), spinach and strawberries. 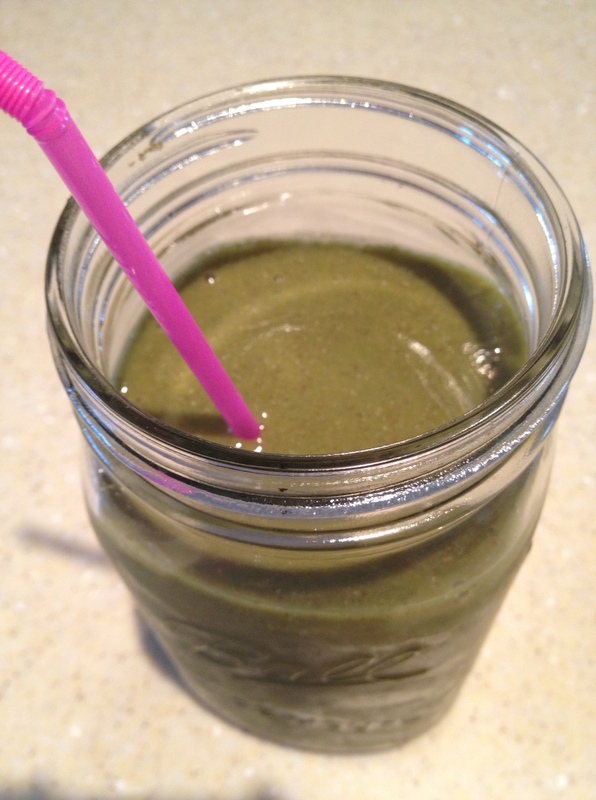 I promise you can’t taste the spinach at all. Put it in your smoothies! 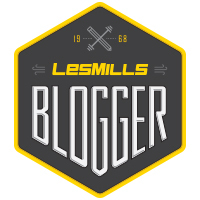 I know that is a weird “healthy living blogger” thing that everyone does, but it really has no taste. I put at least a cup in my smoothies. 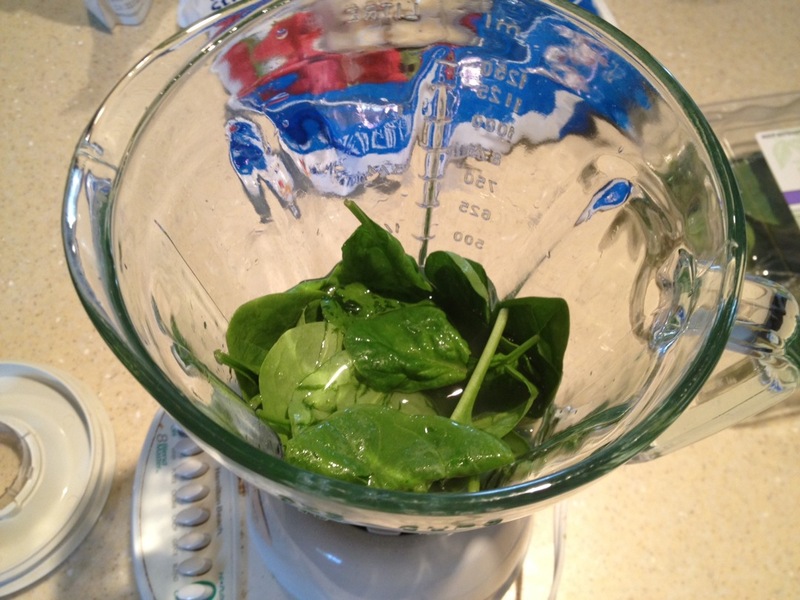 To get things started in this dinosaur of a blender, I rinse the spinach in my salad spinner and then put it in the blender first. I cover it with whatever liquid I’m using. Today was the coconut water, but I also use Silk’s Pure Almond Milk in Unsweetened Original (30 calories). Then I add my dry ingredients. 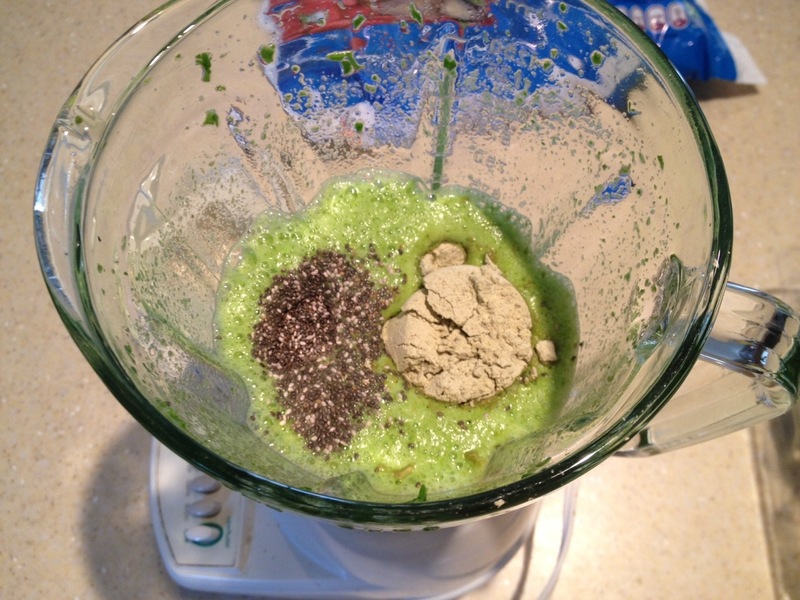 Today was the Vega Tropical Smoothie mix and chia seeds. I forgot about chia seeds for awhile and I’m trying to bring them back! Then I add my frozen berries. After trying different things out this summer, I realized I think frozen blueberries get kinda watery in smoothies, so I haven’t been using them as much. I like frozen bananas and strawberries. I just buy frozen strawberries in a huge bag at the grocery store. For my bananas, I buy a bunch of 6 or so and cut them up and put two bananas in every ziplock bag and keep them in the freezer. I hate to run out of bananas! 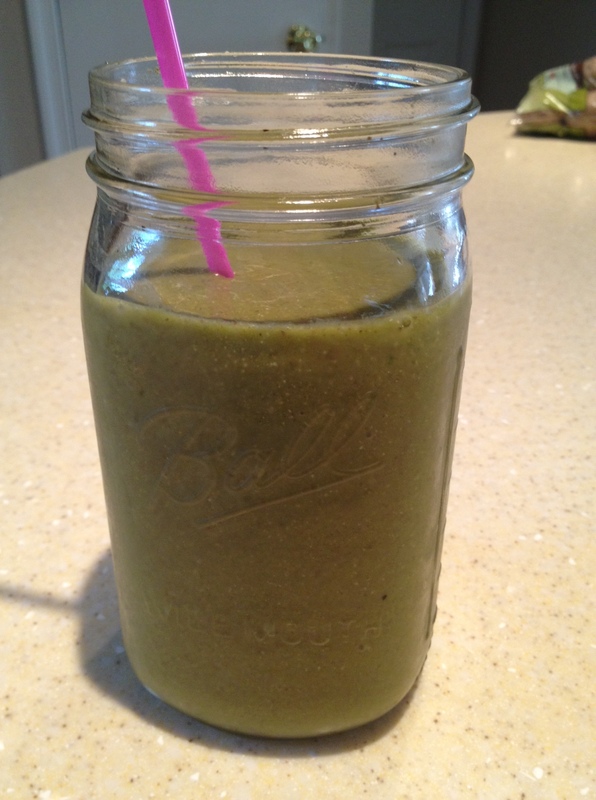 By then, everything is looking pretty gross because of the spinach (I promise you can’t taste it) and the smoothie is usually green. 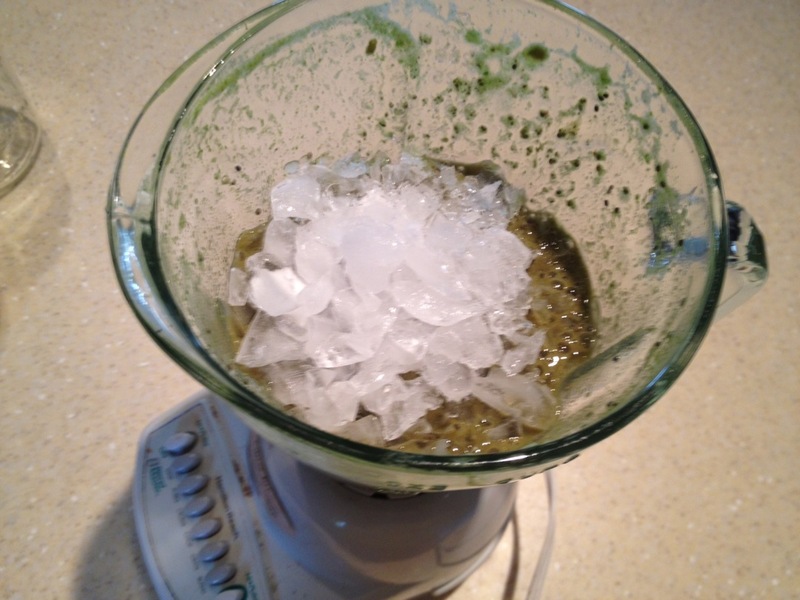 I use crushed ice from my fridge – this blender can’t handle whole cubes… I’ve tried. The ice definitely makes the smoothie bigger and a little thicker. I put it in last, and have to take a spoon and mix it into the smoothie. Then I get frustrated and have to keep stopping it and mixing it around with the spoon so it will all mix. 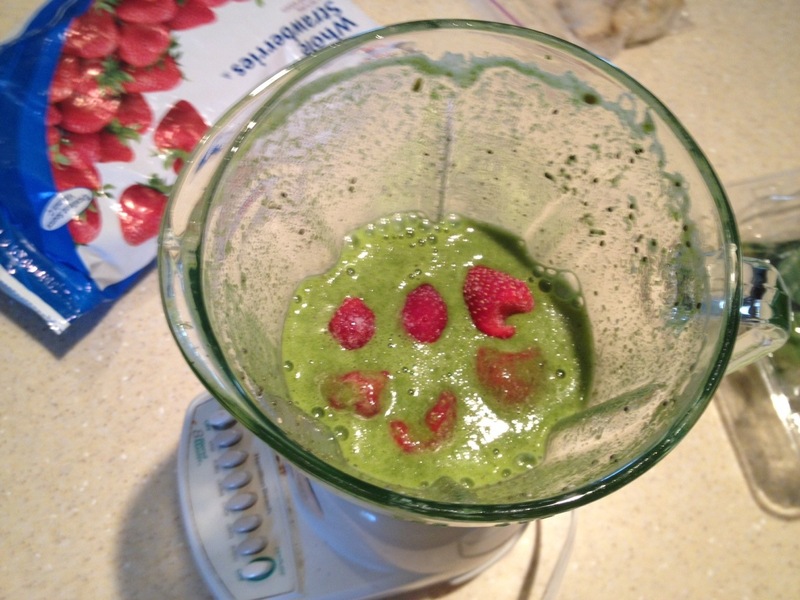 Then the smoothie is done! Today I had a lot so I put it in one of my large mason jars. I really like how much smoothie this makes and it takes awhile to drink all of it! This one is about 300 calories and really keeps me full. My Mom and I went to look for a dress for her to wear to my wedding in October. We ended up going to the shop where we got our bridesmaids dresses. 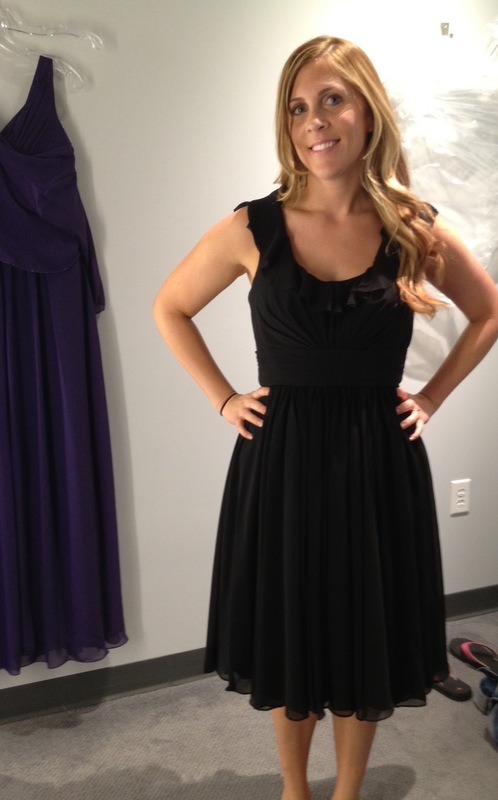 I tried on Colby’s sister’s dress because they just came in and was so happy! I love them! I love the scoop neck and how comfortable the chiffon is to wear. We didn’t get to actually see this exact dress when we ordered it because the store had sold their last one off the rack. The girls had tried on the strapless version of it and we just had to hope that it would work out! Love it! The purple dress hanging in the background is the dress my Mom picked out to wear! 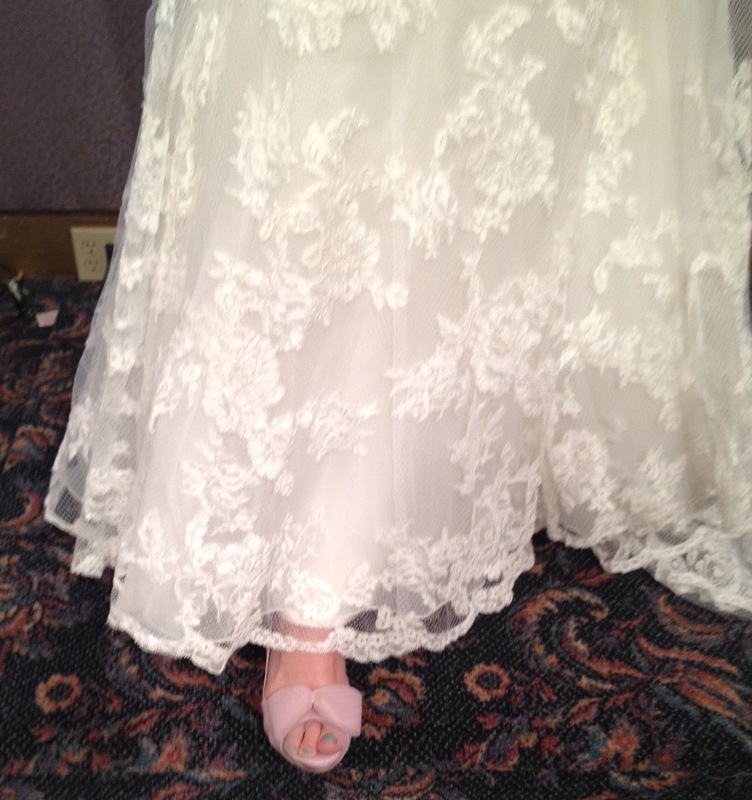 We are going to have it shortened so it is about the same length as the bridesmaid dresses.